Image of the Six Resonant Mode Loop Antenna. 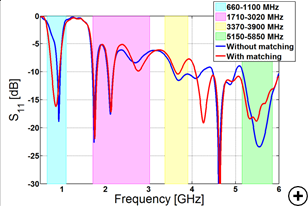 The need for multiband antennas to cover various bands like GSM/LTE, WiFi, GPS etc. are becoming increasingly higher. While PIFA/IFA antennas are very popular their unbalanced modes have high ground plane surface current which make them sensitive to user interaction. The balanced modes of loop antennas on the other hand have less surface current which make them more suitable for user interaction. 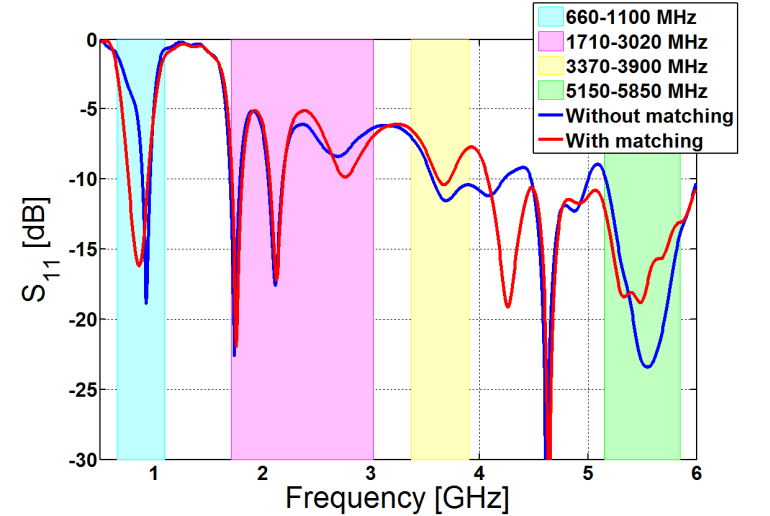 However, these balanced modes have smaller bandwidths than those of conventional PIFAs/IFAs. The six mode loop antenna operates at six modes. Four of these modes are due to the loop antenna itself and the other two modes are from the addition of two parasitic elements. 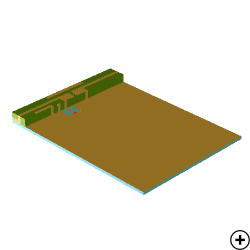 The lowest loop mode’s bandwidth needs to be extended using a matching circuit, while the others are increased by widened sections in the loop. The modes from the parasitic elements extends the upper operating frequency range of the antenna.